One of my favorite things about this blog is that it gives me the platform to discover small business just like Sweetie Tops, which is the creation of a fellow mom, Sharon Moskal. She like many moms believe our daughters should have high quality, hypoallergenic, affordable rings. 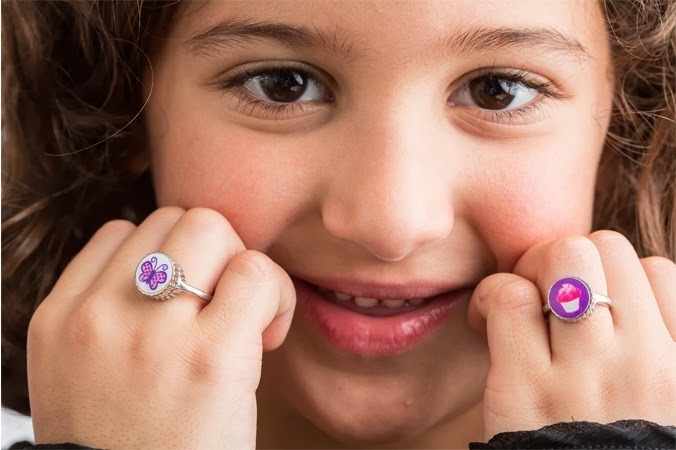 But what makes Sweetie Tops different is that the top of the rings are not only fun and fashionable, but they’re interchangeable too! The base of the ring is made out of surgical steel, and is sized, unlike many children’s jewelry. Arianna loved the idea of the rings tops, and had a fun time picking from the designs. She ended up selecting the cupcake and heart in her favorite colors, pink and purple! The ring fit perfectly on her, but I would suggest that you measure your child’s finger correctly, as it may be tricky to guess their size. Just remember, if the ring is too small for their middle fingers, they can always use it on the pinkie finger – or even as a necklace once they outgrow it! Looks cute. How are the prices? Amy, the ring base is $35.00 and the tops are $12.99 each.